Data for 2014 showed that it was the year that the Spanish property sector stabilised after the turbulent years of crisis which it had endured since 2008. When looking at this data it becomes evident that two of the provinces benefiting most from the upturn are Malaga (Costa del Sol) and Alicante (Costa Blanca). In 2014 only the provinces where Spain’s two major cities are located (Madrid and Barcelona) saw more property sales than Alicante and Malaga. The provinces fared even better when looking just at new-build sales with Alicante in second place with 9,985 sales and Malaga in third with 8,661. The two coastal provinces are benefiting from the incredible rise in the number of foreign buyers which has been witnessed over the last few years. Foreign buyers now make up 13.88% of the market (Q4 2014) and many of them look no further than the Costa Blanca and Costa del Sol which are undoubtedly Spain’s two most recognized coasts internationally. As the new-build sales figures suggest, the two coasts are among the only areas of Spain where developers are building new projects. The Costa Blanca South has seemingly already shaken off the shackles of the crisis and has become an epicentre of new construction with developers now starting to increase prices in areas such as Orihuela Costa. The Costa del Sol was also one of the first areas of Spain to start seeing signs of positivity in its property sector. The coast, which is driven by the allure of destinations such as Marbella and Fuengirola, is now reported to have a lack of new-build property with demand outstripping supply in certain areas. The future looks even brighter due to the diversification of the foreign market which has occurred since the crash. The British market remains strong with an 18.62% market share in Q4 2014 but does not dominate as it once did with the remaining 80%+ of the market being spread across numerous nationalities. Foreign markets with huge growth potential have also started to show interest in Spanish property with Russian buyers becoming a prominent force over the last few years and the Chinese also increasing their share of the foreign market to over 4% in the last quarter of 2014 which bodes well for the future. Also the more traditional markets are picking up with the British increasing their market share from 18.06% to 18.62% from Q3 to Q4 2014, and the Germans from 6.45% to 7.25% in the same period. All this paints a positive picture of the Spanish property sector: a picture that should continue to improve over the coming years. The Spanish National Statistics Institute (INE) has released its data for sales made in December 2014 and its round up of data for the year of 2014. Results are extremely positive with sales up by 15.7% year-on-year for December and a 2.2% increase being recorded for 2014 as a whole. The annual increase ends years of extreme decreases in the number of sales of Spanish property with sales dropping by 18.1% in 2011, 11.5% in 2012 and 1.9% in 2013. A total of 319,389 homes were sold in Spain during 2014 which is down 59% from the peak in 2007 when 775,300 homes were sold. Data shows a clear split between the first and second halves of the year with sales rebounding strongly in the last six months of 2014 and double digit year-on-year percentage increases in sales have been recorded from September onwards (September +13.7%, October +16%, November +14% and December +15.7%). Re-sales were the driving force behind the increase in sales and made up 63% of total sales with 199,943 transactions up 18.4% on 2013. New-build performed badly during 2014 and accounted for the remaining 37% of sales with 119,446 transactions, a figure that was down by 16.9% on the previous year. The Spanish regions which recorded the strongest sales increases in 2014 according to INE data were the Balearic Islands with an 18.5% increase, Navarra: +13.9% and the Canary Islands: +12%. The largest declines in sales were registered in La Rioja: -25.1%, Castilla-la-Mancha: -12.6% and Murcia: -6.3%. The annual change for other important regions was as follows – Madrid: +6.9%, Catalonia: +3.8%, the Valencia region: +2.5% and Andalucia: +0.3%. The highest number of transactions per 100,000 inhabitants was in the Valencia region with 1,182, it was followed by the Balearic Islands: 1,043 and the Canary Islands: 1,015. Although Spanish banks continue to hold large portfolios of property on their books, the rate at which they are being removed is increasing. In 2014 listed Spanish banks sold and leased a total of 86,726 properties which marks an 18.7% increase on 2013. The total value of these property transactions was €13,619 million, up 6.4% on 2013. Caixa Bank recorded the most impressive numbers with 23,400 property sales and leases, 35,870 if including those made through developers supported by the bank. The value of these transactions was €2,512 million although this rose to €5,432 if including sales and leases made by third parties. The bank seems to have benefited from its focus on leasing a large number of its properties. Rentals accounted for €1,132 million, 45% of the €2,512 million in direct turnover made by the bank from property. The results provide further evidence of the strengthening of the Spanish rental market and the possibilities available in the buy-to-let sector. Other major banks with significant transaction volumes in 2014 were BBVA which shifted 23,069 properties for a total value of €1,932 million and Banco Sabadell (Solvia) with 16,172 properties for €2,774 million. The banks will hope that 2015 will see similar success and allow them to move on even larger amounts of their stock. 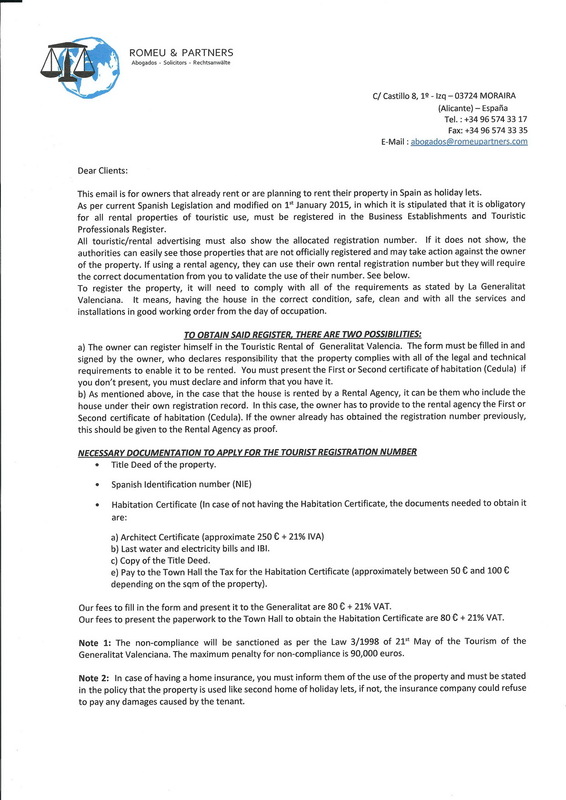 Permission to re-publish granted by Fuster & Associates. Have a comment on Spanish Property News?